In the first part of this blog post, I shared some fundamental ideas that form as background information for what I want to achieve here. So if you haven’t read that one yet, I recommend you to check it out. Effective automated testing is a natural prerequisite for Continuous Integration & Delivery. How can it not be? If you’re not getting quick and broad feedback from your software, how can you delivery frequently? So having a testable architecture and an effective test strategy is very crucial. Let’s dive in. I’m a huge fan of subcutaneous testing. This type of testing starts right under the UI layer with a large scope (which preferably spans all the way down to the data store) can have a great return on investment. On Kent Beck’s feedback chart it would score high up and to the right: fast and broad feedback. So now that we want to target our automated tests below the delivery mechanism layer (UI, Network etc. ), this is where an important architectural decision comes into question. What is the main boundary of my application? Where does my significant business logic start? Plus, how can I make my application boundary very visible and clear to all developers? If you follow down this path of thinking, one nice place to end up is a combination of command and mediator patterns. The combination of these patterns is about sending commands down through a very narrow facade, where every command has a very clean input and output “data transfer objects” or POCO’s, POJO’s.. whatever you like to call them depending on your stack of choice. They’re simply objects that carry data and no behavior. To be able to use this pattern in my REST API, I’ve created a simple module in TypeScript that allows me to execute commands and optionally get results from them. It’s here: TypeScriptCommandPattern. In the example below, you can see how a test request is sent down to the executor and a result is returned back. And here is how a “Hello World” style command handler looks like. Notice that it has a clean request and response definitions. At the end of the implementation we make sure that the handler is registered and mapped to the request. In this structure handlers are singleton objects and they can later be resolved by the type of the request and then get executed. Each of these TypeScript modules are a vertical slice. They’re the full story. Yes they make use of other external modules when necessary, but when developers read through these scenarios, they get the full picture. And if code sharing between these scenarios are done wisely (with correct abstractions), then a change in one scenario is contained and does not necessarily affect any others. Line 3–4: Imports the base async command handling structure and also the container to register itself at the end of the file. Line 6–9: External modules that this handler uses. Line 11–12: A module that is used by multiple scenarios. Be careful, I say “used” not “reused”. Remember the “fallacy of reuse”. This module (IdeaPrePostProcessor) is used to massage and sanitize the Idea entities before they’re sent to the user interface and before they’re written to the database. Multiple scenarios use this module the exact same way and for the same need. There are no slight variations per scenario, that’s why it’s a right abstraction and that’s why it’s “use”, not “reuse”. Line 14–16: Since our handler is an async one (because it’s accessing the database), it implements the AsyncCommandHandler<TRequest, TResponse> and implements the HandleAsync method that returns a Promise of GetIdeasReponse object. Line 17–38: Complete vertical implementation of the handler. It’s basically scanning the database for all the ideas, sorting them based on an algorithm, encapsulating them in the response object and return. Notice that at line 25, the “await” keyword is used. It’s a simple and very readable way of representing asynchronous code. It exists in recent versions of TypeScript as well as in ES7. Line 42–47: Request and response objects that are used by this handler are defined and exported. These objects should be available to the rest of the application as well. If you have experience with building MVC type web applications or REST API’s you’re probably familiar with the idea of controllers. Routes are the same concept in ExpressJS. Keeping your routes and controllers nice and clean is a good discipline to have. Remember, we want to contain our core application logic and try not to leak it outside as much as possible. Not to frameworks, not to external libraries. 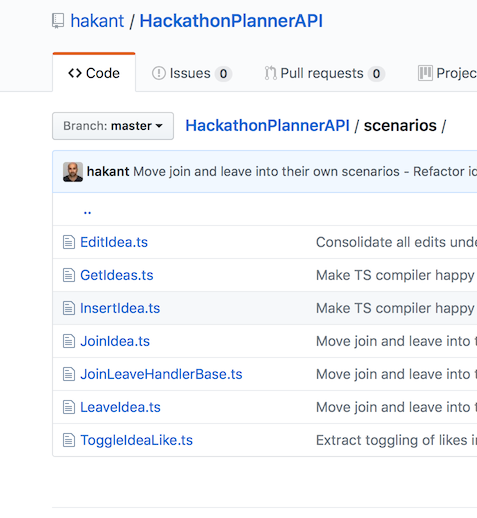 Hackathon Planner’s most significant route is the Ideas route where ideas are being CRUD and a few further actions are taken against them. Code below shows the routes defined in there. Notice how clean it reads and how all business logic is kept out of it. The only thing these routes do is to pass requests and responses up and down the stream. Remove the ExpressJS layer that normally sits on top. This is a delivery mechanism and I don’t necessarily need it to test my business logic — since I’ve already separated that logic clearly out of this layer. Load all scenario handlers together with the real data store (or a realistic emulator). Shoot requests & verify responses. In some cases, if verifying the response alone isn't sufficient, go further and directly check the data store for verifying the side effects. In my case it wasn’t necessary, I could both act and verify using my handlers alone. Let’s take a look at a few of these tests. Below is a part of jasmine spec that tests inserting and fetching ideas by running several scenarios. Lines 17–26: Before each test new NoSql tables are created and after each test they’re dropped. This makes every test run in a sandbox isolated from one another. So they can all run in any random order. In general, this is a characteristic of a unit test, not an integration test. So here we have the best of both worlds! All tests run against a DynamoDb local emulator. So the feedback coming from the database is real. I trust that the Amazon team behind DynamoDb makes sure that the emulator behaves exactly the same as the real one in the cloud. Integration tests are slow right? No, not if you don’t test against user interfaces, or have many number of network calls, or use slow data storage devices. These tests don’t get into any complexity of testing against a UI; they don’t bring up a web server and make excessive number of network calls; and they make use of an in memory database emulator running on the same box. These 15 tests run in ~2 seconds even though each of them setup and tear down their data tables. So you can run quite a lot of these in a few minutes. By their nature, integration tests are broad. They give broad feedback. But this is a trade off because when they fail, you have to dig a little deeper to understand exactly what failed in comparison to the unit tests that are tiny and focused. But that’s a tradeoff I like to make in general. Having said that, I’m by no means trying to trash the value of unit tests here. If I see the need — like any piece of code that is significant for the system and does interesting things — I’ll go and unit test that part in isolation. Especially code that’s heavy on algorithmic work. So unit tests are valuable when they’re implemented for the right code against the right abstraction. Last but not least, these type of tests (i.e subcutaneous) interacts with the system right at the outside of the significant boundary. This means as long as feature requirements don’t change, these tests remain valid and useful. They can survive large refactorings because they’re not coupled to the implementation details! This is a huge deal in my opinion. In next and the last part of this series, I would like to write a few things about my experience with setting up a CD pipeline using CircleCI, which transpiles all TypeScript files, installs dependencies, runs tests and deploys to AWS Elastic Beanstalk. In this post, I'm taking a deep dive into setting up a continuous delivery pipeline using CircleCI.